Paper • ISBN-13:9781608469567• US $17.95 • 5.5 in x 8.5 in• 320 pgs. An estimated 80,000 Americans are held in solitary confinement in prisons across the country. Solitary confinement, often in cells no bigger than 6 by 10 feet, means 24 hours per day with little or no meaningful human contact. 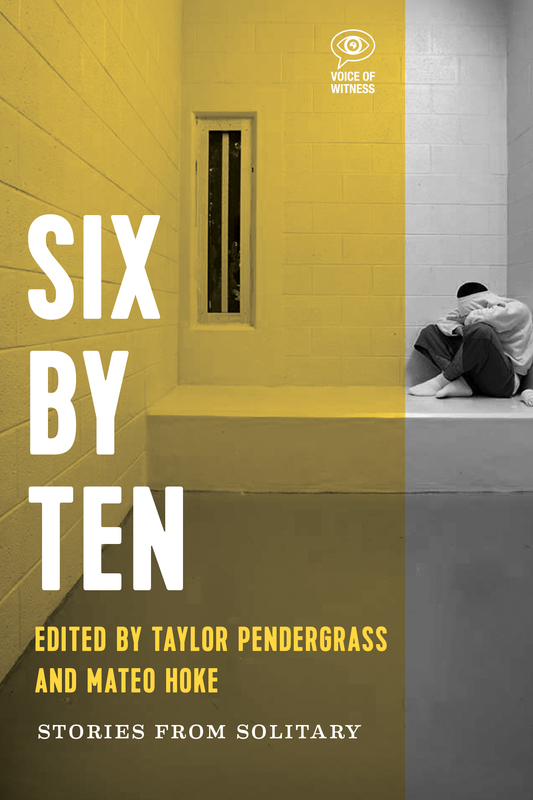 Six By Ten explores the mental, physical, and spiritual impacts of America’s widespread embrace of solitary confinement, as told through the first-person narratives of individuals subjected to solitary confinement, family members on the outside, and corrections officers. Each chapter presents a different individual’s story and probes how Americans from all over the country and all walks of life find themselves held in solitary for years or even decades at a time. Heather Ann Thompson, Pulitzer Prize-winning author of Blood in the Water: The Attica Prison Uprising of 1971 and Its Legacy. Mateo Hoke is writer, journalist, and coeditor of Palestine Speaks: Narratives of Life under Occupation. He studied journalism at the University of Colorado and the University of California-Berkeley Graduate School of Journalism. Taylor Pendergrass is an advocate and activist around ending mass incarceration and racial injustice in the criminal legal system. He currently works for the ACLU and lives in Denver, Colorado. He graduated from Duke University and the University of Colorado School of Law.